The WingThe Wing is only open to women. 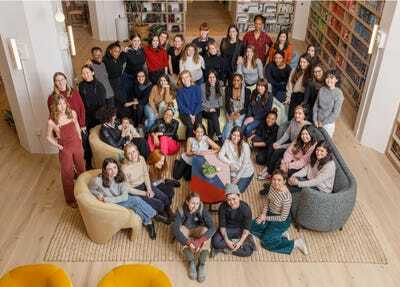 The Wing, a women-only coworking space and club that has raised $US32 million from investors like WeWork, has three locations in New York City, and one in Washington D.C.
On Monday, Jezebel reported that The Wing is under investigation by the New York City Commission on Human Rights for possible violation of the city’s strict anti-discrimination laws. An outpouring of support on Twitter from members of The Wing has gained the attention of the Commission, and on Wednesday, mayor Bill de Blasio stated his office supports The Wing. The Wing, a women-only coworking space and social club that has three locations in New York City and one in Washington D.C., is under investigation by the New York City Commission on Human Rights due to its strict no-men-allowed club rules – possibly violating the city’s Human Rights Law, Jezebel reported. On Wednesday, Gelman and Dunn told Business Insider that they heard about the Commission’s investigation from the Jezebel journalist before hearing from the Commission themselves – leaving Gelman confused about what motivated the leak. “Quite surprisingly, the Commission reached out to us on the first day of Women’s History Month. That call has resulted in nothing more than an agreement to meet and have a conversation – in fact, we have been assured that the de Blasio Administration fully supports the mission of The Wing and will work with us to see it prosper. Because of the history of women in this country – and even more so in this time we live in – it is important to protect and foster the work of The Wing and similar space that give women a positive and safe space to thrive,” said Gelman in a statement. After Jezebel broke the news of the investigation, Gelman notified members of The Wing in an email statement – requesting that they Tweet at both the Commission and mayor Bill de Blasio. Members immediately took to Twitter, vocalizing their opinions about the investigation and The Wing.
.@the_wing is one of the leading organizations for empowering and promoting the voices of women today — and should do so long into the future.